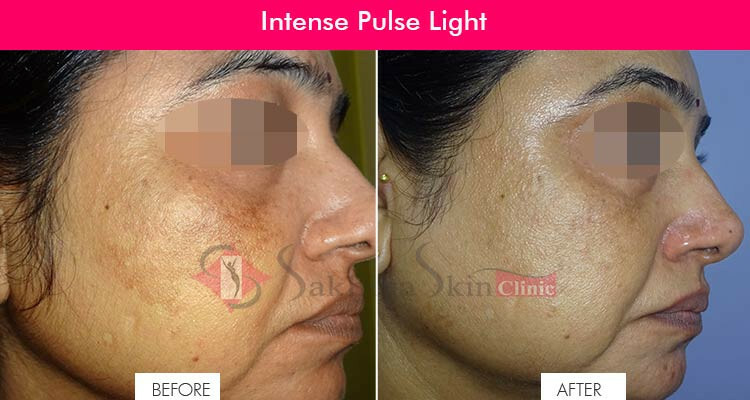 Intense Pulsed Light (IPL) is a modern technology that is used by various cosmeticians and surgeons to treat a number of skin problems and issues related to it. This technique is used for aesthetic and remedial purpose also. IPL also known as Flashlamp Therapy, is popular for its ability to improve the appearance of several skin problems like – age spots, acne, rosacea, measles, vascular lesions, wrinkles and unwanted hair. IPL uses vigorous pulses of visible multi-coloured light that breaks down or damages the melanin, which causes age spots and pigmentation. It has panoply of advantages starting from eradication of facial lines, scars, pimples to hair removal also including visible improvement in skin’s tone and texture. IPL framework depends on the principle of laser technique in which the non coherent light of different wave lengths is generated. The range of these wavelengths vary from 500nm to 1100 nm. After that, the produced light is released and is enabled to focus on the targeted areas of the skin. Each IPL system consists of cooling systems like cryogen sprays so as to protect the epidermis, the upper layer of skin in contact with the IPL system. Patients suffering from age spots and those who want to go for rejuvenation of the skin must consider IPL as one of the most advanced techniques. IPL technique is designed to cure all your skin problems like – rosacea, pimples, face lines, vascular lesions, unwanted hair and spider veins. IPL has long-term positive effects on the skin. It works well for all types of skin. Apart from these, IPL is a relatively gentle, non-ablative, less expensive and a convenient treatment. WHAT IS AN INTENSE PULSE LIGHT? A light based treatment similar to laser treatment, which is effective for reducing redness, brown spots, uneven skin tone and age spots. HOW DOES IT WORK? DOES IT REJUVENATE MY SKIN? IPL technology improves the appearance of photo-aged skin, removes age spots (sun-induced freckles), most benign brown pigments, and redness caused by broken capillaries through a process called Photorejuvenation for the face and the body. The process is ideal for patients with active lifestyles because the procedure requires no downtime and has very low risk of side effects. Not really! The treatment sensation varies from patient to patient. IPL is safe, non-invasive, has minimal side effects and requires no recovery time. IPL is gentler than laser and much faster as a larger area can be treated with each flash. HOW DOES IPL WORK ON FINE LINES AND WRINKLES? When treating fine lines and wrinkles, the light stimulates the growth of collagen, which makes the skin feel plumper and more youthful. HOW DOES IPL WORK ON SKIN PIGMENTATION? When treating unwanted areas of pigmentation, targeted areas momentarily absorb the light & generate heat. This breaks down the pigmentation into tiny particles, which then either rise to the skin’s surface as scabs, which are exfoliated away naturally within 1-2 weeks, or the particles are filtered away through the lymphatic system in your body. HOW DOES IPL WORK ON THREAD VEINS? When treating thread veins (or other vascular conditions), the light is absorbed by the oxyhaemoglobin in the blood within the vein, causing the blood to coagulate and the thread vein to break up into particles that can be filtered away naturally through the lymphatic system in your body. IN HOW MANY TREATMENTS CAN I HAVE OPTIMUM SKIN REJUVENATION? At least 4 to 6 sessions are required (2-4 weeks apart). Apply sunscreen above SPF 30 daily.